Comments Off on Mortgage Escrow: What are Escrow Services for Mortgages? Mortgage escrow is a term used when money is placed into a third party account for further use with a second party. It cannot be used either by the payer or the recipient until certain conditions have been met. The third party will then release the funds as directed. Such services are generally operated by firms that have been licensed to do so. So what are escrow services with mortgages? Under what conditions would you use a mortgage escrow service when purchasing real estate? First, let’s discuss escrow in general prior to its specific application in mortgage and real estate lending. An escrow service holds funds or documents for the parties concerned until each agrees that what is being held should be disbursed. A very simple example would be a pool game between you and another person for $5. You each pay a bystander your $5, who then gives the $10 to the winner. In this case, the bystander would be holding each person’s $5 in escrow, the total $10 to be released to the winner. Mortgage escrow is similar. Funds are paid to an escrow company that releases the funds as agreed once certain conditions have been met. The escrow holder has no benefit other than any fee agreed for them holding the money. The escrow holder is providing an escrow service. In the United States, an escrow payment would be paid by for that art of a mortgage payment intended to cover such commitments as hazard insurance and property taxes. This payment is over and above what is due for mortgage interest and principal repayments. You may have heard the term ‘PITI’ which means Principal, Interest, Tax and Insurance. You may be required to pay your Tax and Insurance into an escrow account. 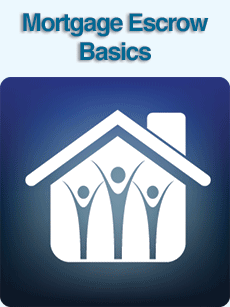 With most mortgage types it is an option but with FHA loans it is mandatory. Funds can be paid regularly into the escrow account, and when the payment becomes due there will always be cash available to pay the bill. Fundamentally, mortgage escrow is the holding of funds by a third party until they must be paid by the first to the second party. Escrow services are those that offer this arrangement for both parties. They must be licensed to carry out this function. Mortgage escrow is a fact of life that many might avoid, but that might also become an essential part of home purchase. Before using a mortgage escrow service, check first with the regulating authority. You can find this on their website. Always check out any escrow service before dealing with it. By doing that you can avoid fraudulent firms and save yourself from losing a great deal of money. Check out our site for more information on escrow services for mortgages. Have escrow questions? We can help! Please contact us at the phone number at the top of the page for help in answering your escrow questions!